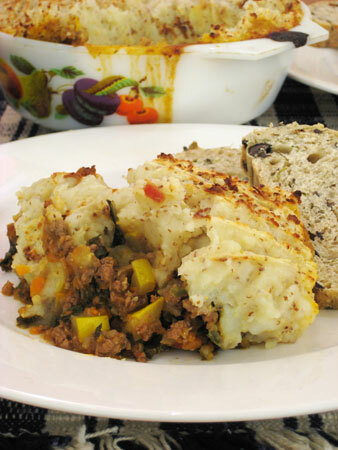 Ye olde cottage pie is a favourite in our household. It’s one of the ever culinary Mr P’s signature dishes and as such I usually don’t go near the making of them myself. I wouldn’t dare. 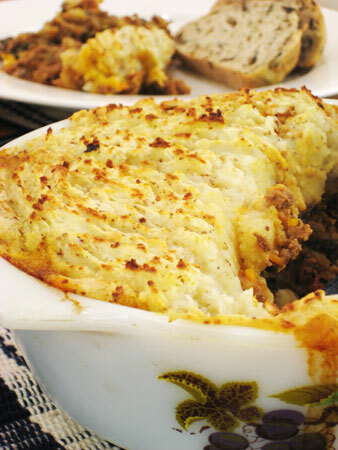 He has been know to whip up a cottage pie, impromptu, on a chilly autumn evening that makes the child in me weep with joy. But one evening, with a bumper load of Summer produce in the fridge, a package of minced beef ready to use and Mr P working rather later than usual, I decided to tread on his territory a little and rustly up dinner loving. He didn’t really seem to mind too much, so I know it’s not half bad. This is a great dish to make as the weather turns a little nippy and you want to use up some Summer produce still kicking around. 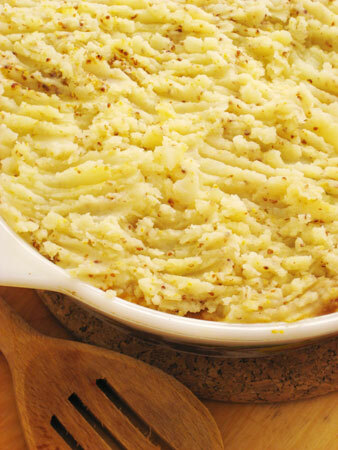 Incidentally, does anyone know the difference between Cottage Pie and Shepherds pie? I’ll give you a hint, the reason is in the name! – put a pot of water on to boil. When it’s boiling add the potatoes and lower the heat. Cook for about 10 or 15 minutes until done (when a fork slides easily into the potato chunks). Drain and reserve. 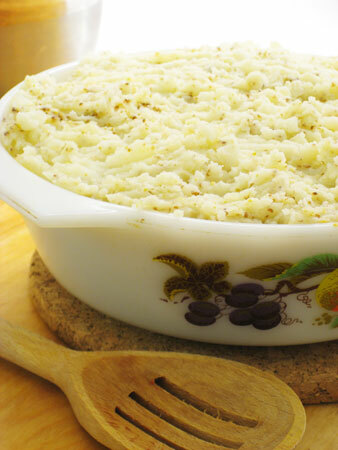 – half fill a casserole with the meat mixture, top with the potato mash and bake for 25 – 30 mins, until the top is browned and crisp. Sometimes we bite off more than we can chew. Did you ever, as a child, put an entire hard boiled egg in your mouth at a picnic, and then sit there (knowing your Mother could see you) and realise you couldn’t spit it out, abut couldn’t chew and swallow it all either? Oh the dilemma. 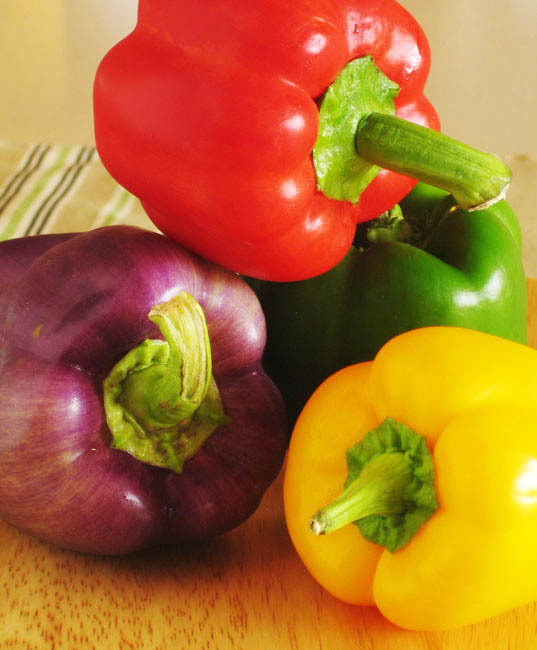 I was irresistibly lured to a table at Saturday’s market covered in punnets of brightly coloured sweet bell peppers. Poor Mr P already had the glazed over eyes of a pet chihuahua being dressed up in frills again, when I spotted them down the isle and uttered a wee whoop of excitement. So, to inspire a second wind of Excitement and Vigour for all things shopping, I sold the idea of buying yet more produce to have to lug home by mentioning some magic words: Stuffed Peppers, and, Minced Beef. Oh, that brought the twinkle back long enough to persuade him to help find the prettiest and shiniest peppers by far. But now I was committed, through the Kharmic backlash of my own desire for all things shiny, to actually make the damn things. I decided against the mince in the end, simply because we’d had quite the culinary weekend and I felt like something more, well, simple really. Of course, having not made stuffed peppers in many a year, I’d forgotten just how long they take to make, the results of which were that we only ended up eating our dinner at ten last night! Well, at least it was good. And shiny. Note on the recipe: I used 3 anchovy fillets in the recipe, but in retrospect it could have used an extra 3. – start by putting the rice on to cook and pre heating the oven to 380˚F (wild rice can take longer to cook, mine took 45mins) when done, remove from heat and set aside. 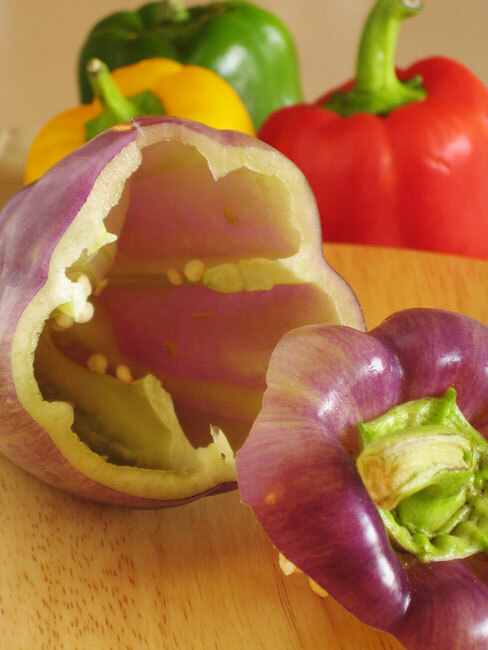 – carefully slice the tops off the peppers, keeping them intact. remove all the seeds and inner squishy stuff. Wash inside and out and put aside. – heat the oil in a saucepan over a medium heat, add shallots and garlic. Saute until translucent. – In a large mixing bowl, mix rice, tomato sauce and the rest of the ingredients (excluding the stock), leaving about 2 Tbsp of the cheese aside. 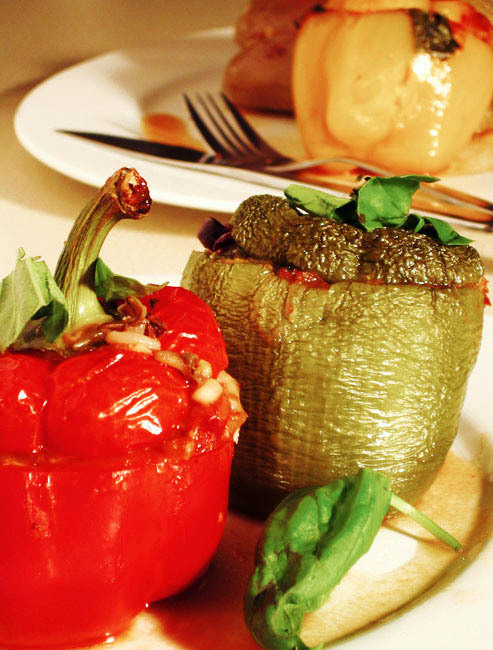 – arrange peppers bottom down in a greased, oven proof dish. Fill with rice mixture, sprinkle with remaining cheese and place tops on top. – pour stock into the dish and bake for about 1 hour in the oven, basting with the stock every 20 mins to keep the veg moist on top.